Since being uploaded two days ago, a video of Atlas the robot pulling off the perfect backflip has been watched over 6.5 million times on YouTube. 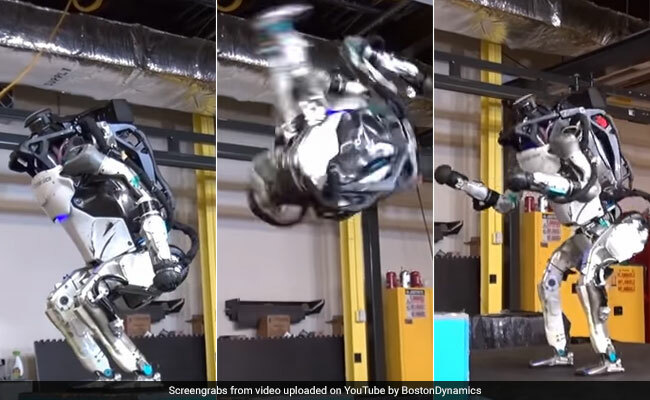 Boston Dynamics' humanoid robot can run, jump and backflip better than most of us and it has some on Twitter certain there's a "robocalypse" coming. And while we're (almost) 100 per cent sure the robots aren't coming for us just yet, there's no denying the video makes for an incredible watch. On YouTube alone, the video of Atlas the robot celebrating a perfect landing after a backflip has been watched over six million times in 48 hours. Boston Dynamics posted the nearly minute-long video of Atlas the robot's impressive gymnastic moves on November 16. The video shows the bipedal robot leap from block to block with ease. Atlas then does a backflip and lands firmly on its feet. The robot even lifts its "arms" up in the air as if to celebrate. But, as the bloopers towards the end of the video show, it wasn't always smooth sailing. So make sure you watch the entire video! I'm amazed, fascinated & terrified at the same time. I've been terrified of the roboapocalypse for years, but when that thing did the backflip, I lost it. We're done, and we deserve it. Def has a soul. Def gonna backfire. HAVE WE NOT WATCHED ENOUGH MOVIES ON THIS TO KNOW?!?!? I, for one, welcome our new parkour robot overlords. Atlas the robot is 1.5 metres tall, weighs 75 kilograms and has 28 joints in its body. What do you think of the robot's backflip: terrific, terrifying or a little bit of both? Let us know what you think in the comments section below.